The FCC (Federal Communications Commission) mandates that all VoIP services provide 911 services, as a result of which, the traditional core 911 network is evolving to NG9-1-1 technology enabling end-users to not only access 911 services through voice calls, but also permit text-to-911, images, video and data to PSAPs. NG9-1-1 networks based on the National Emergency Number Association (NENA) i3 standards define network transformation route to receive and respond to NG9-1-1 emergency requests via multiple media sources such as SMS, Video, Email, and Instant Messaging (IM). Messaging proves to be useful for many who have speech or hearing disabilities, as well as others who are unable to use voice in emergency situations and prefer to engage with PSAPs in private chat. Major wireless carriers have committed to providing Text-to-911 services to end users. When a Wireless user calls 911 (either voice, or text-to-911), they are converted to SIP MESSAGE requests at the gateway and is routed to the call taker (PSAP). The response from the call takers are again converted back at the gateway to the original message format and forwarded to the end user. The 911 system uses nearest cell towers information to which the Wireless user is connected to identify user location. In addition to these services that are primarily dependent on carriers, there are many OTT (Over the Top) Instant Messaging apps which connect users with the NG9-1-1 system directly. Scripts to perform advanced tests using SIP methods like SUBSCRIBE/NOTIFY, REFER and INFO for testing NG9-1-1 interfaces. Public safety communications service providers have deployed GL test tools for verifying their traditional 911 Emergency Services over CAMA trunks. Continuing with our efforts to add test tools to NG9-1-1, GL offers enhanced MAPS™ SIP emulator for Emergency Services Internet Protocol Networks (ESInets) to enable call delivery using Session Internet Protocol (SIP), as well as Instant Messaging (IM) delivery conforming with RFC 4975/4976 - Message Session Relay Protocol (MSRP) protocol. Unlike regular SMSs, for a NG9-1-1 Emergency Request using IM requires a series of instant messages exchanged between two or more parties treated as a single conversational message session. 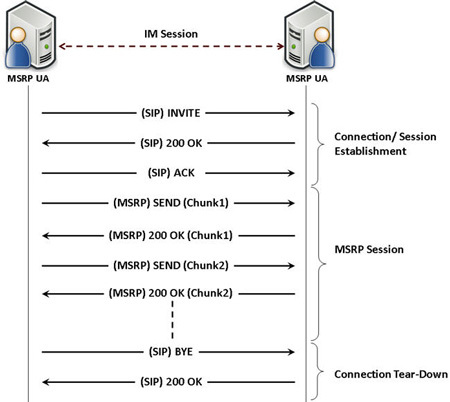 Such a “session-mode” IM is possible using Message Session Relay Protocol (MSRP) where a series of related instant messages using SIP are treated similar to audio or video media sessions. 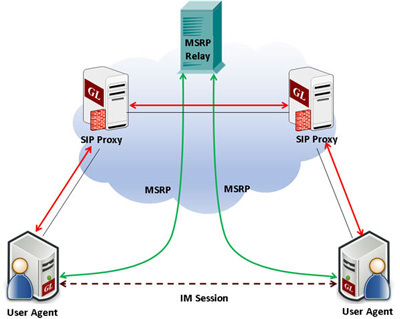 MSRP supports multiple sessions to different end-points to be established over a single TCP connection. MAPS™ SIP can simulate the end-points (SIP/RTP or SIP/MSRP User Agents) in an NG9-1-1 network and send and receive communications over ESInets, The software is capable of simulating high volume SIP sessions for load testing, and reporting thresholds. MAPS™ SIP (requires PKS120, PKS102/PKS109 licenses) software supports simulation of SIP/RTP sessions as well as instant messaging sessions over SIP using MSRP protocol (requires PKS112 licenses). The NG9-1-1 calls can be IM Only Calls, Audio and IM Calls, and Video and IM Calls between multiple UAs. The simulation allows vendors to verify the expected functionalities of all components within ESInet for routing, transfers, inter-operability, and responses resulting in reliable communication between SIP UAs and NG-PSAPs. The MAPS™ SIP MSRP emulation can be used to ensure that a subscriber's emergency call gets routed to the appropriate PSAP and automatically pinpoints the caller's location information. Ready-to-use scripts and custom-build scripts allow for advanced test scenarios using SIP methods like SUBSCRIBE/NOTIFY, REFER and INFO for testing NG9-1-1 interfaces. MAPS™ SIP provides high-level and low-level APIs to be easily integrated into customer test environment for automated and remote testing. APIs are available in Python, Java, TCL, and VBScript. The above Instant text messaging flow is an example of communication exchange achieved using MAPS™ SIP and DUT (SIP PSAPs or SIP Phones). The software uses SIP as the transport protocol for exchanging SDP parameters. TCP IP and port are negotiated with MSRP Server. The MSRP message session is established (similar to RTP). In this method, multiple SIP MESSAGE requests are consistently delivered to the same call taker. Within the session, media exchange and message transfer by chunking is handled. Each chunk is sent as a separate SEND request and is acknowledged (200 OK) by the endpoint. Reports can be used to verify the successful message transfer completion. 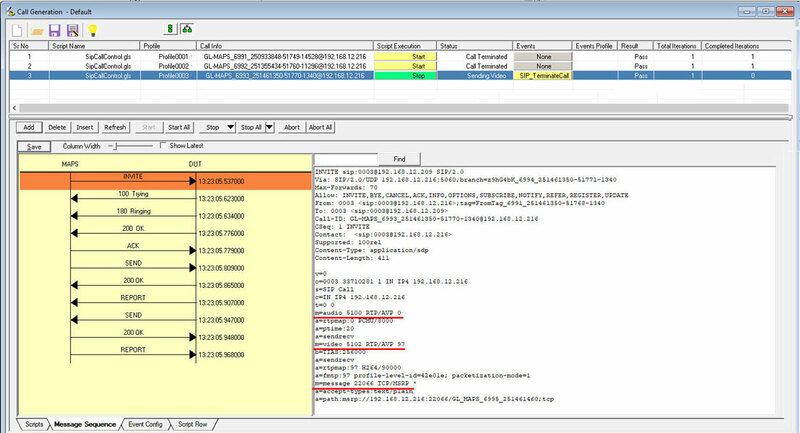 The following call generation screenshot depicts the MAPS™ SIP simulating ‘Audio and IM Calls’. During this call type two different sessions will be established, one for audio using RTP session and another for instant messaging using MSRP session, both sessions are handled simultaneously. The following call generation screenshot depicts the ‘IM Only’ call simulation. Only IM call is initiated from one of the UA terminals. During this call type, only text messages are sent/received using MSRP sessions. MAPS™ SIP also handles simulation of ‘Video with IM Call’, during which a pre-recorded video is sent and received alongside ongoing IM session. Thus, it’s possible to simulate audio, video and text messages (using MSRP) on the same call. During this call type, there will be three media lines, one for audio, one for video, and another for instant messages using MSRP. Supports UDP, TCP, and TLS transport types. Read the IM message content from a pre-defined text file (user-configurable) and transmits the same on established IM session. Received messages can be recorded to a text file for every MSRP session. User can configure the Rx file path. Text file can have multiple lines of message. The CRLF will be the de-limiter to treat each line as a new message. Message chunking is supported, where user can configure the chunk size, else by default if the message size exceeds 2048 it will be chunked (as per spec). record and report success and failure reports in MSRP SEND method. control the iteration count i.e. how many times the same message content from the input text file is repeated throughout the call duration. define message generation interval to control the message frequency on the call. High Density version capable of high call intensity (hundreds of calls/sec) and high volume of sustained calls (tens of thousands of simultaneous calls/platform). Supports almost all industry standard codec types - G.711 (mu-Law and A-Law), G.722, G.729, G.726, GSM, AMR, EVRC, SMV, iLBC, SPEEX, EVS, OPUS, and more. *AMR and EVRC variants require additional licenses. Click here for comprehensive information on supported codecs. Supports both RTP G.711 Pass Through Fax Simulation and T.38 Fax Simulation over UDPTL. GL offers various network monitoring solutions to monitor traditional 9-1-1, E9-1-1, as well as NG9-1-1 networks for analyzing the performance of signaling and traffic. various measurement and reporting tools are provided to facilitate in-depth troubleshooting. GL’s NetSurveyorWeb software is a core network monitoring solution for wide range of protocols and is based on an open three tier distributed architecture driven by non-intrusive hardware or software probes, intelligent software, and a database engine. While GL’s VQuad™ - WebViewer™ solution is driven by intrusive probes to get real-time voice, video, and data quality measurements across a diverse set of networks. Voice and Video calls are automatically placed between end points; quality is measured and forwarded to a centralized location. Similarly, Data Tests supports TCP, UDP, VoIP, Route, HTTP, FTP, DNS, SMS, Email, PhoneInfo, SIMInfo, and UEInfo.